“I hate politics,” Allen said. 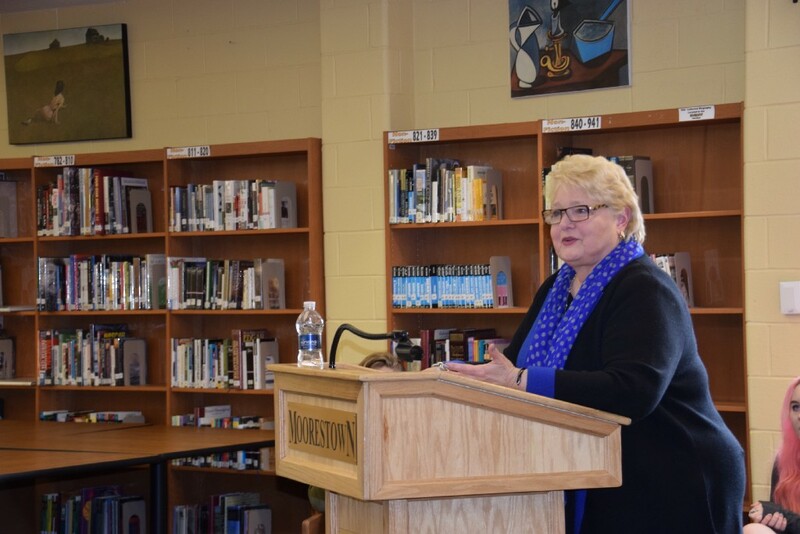 The Moorestown High School Human Rights Club hosted Senator Diane Allen on March 24. Allen spoke about her career and what it’s like being a woman in politics. State Sen. Diane Allen, a Moorestown High School graduate, returned to her alma mater last month to speak to the MHS Human Rights Club about women, politics and democracy. Allen, who represents New Jersey’s 7th Legislative District, has served on the New Jersey Relations Council, the Martin Luther King Jr. Commission and was a delegate for the Republican National Convention. Born in New Jersey, Allen has also been a Sunday school teacher, award-winning television news journalist, mother, pilot and hang-glider, according to the New Jersey Senate Republican Office. The Human Rights Club focuses on current happenings, meaningful historic events and is comprised of students from all grade levels with a passion for advocacy. Allen spoke of the danger of a white male-dominated legislature, saying this is a recipe for underrepresentation. Allen went on to say until the legislature is truly reflective, there isn’t much of a democracy. She also provided the caveat that she has nothing against old white men — after all, she is married to one. Allen’s view on politics isn’t quite what one might expect from someone who has been involved with government for decades. Allen also spoke of her journalism career and the obstacles she overcame, once being fired for refusing to lead a news broadcast with her boss’ daughter’s engagement. Allen will retire from her political career this year as she has chosen to not seek re-election in November.